28 | Rentonwa.gov RENTON RENTAL FACILITIES Please call 425-430-6700 for availability. > Weddings > Anniversaries > Birthday Parties > Business Meetings > Conferences > Baby Showers > Reunions > Banquets • Beautiful hardwood floors, 3300 square feet, accommodates up to 230 Banquet Style seating or 300 Theatre Style seating. • Doors open onto outdoor patio overlooking the Cedar River and a full catering kitchen is attached. • Reservations are currently being taken up to 12 months in advance. Fees range between $85-150 per hour, depending on event type, time and day of week. 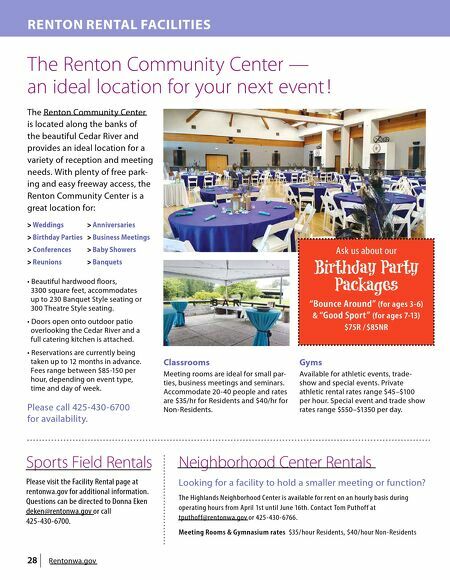 The Renton Community Center — an ideal location for your next event ! The Renton Community Center is located along the banks of the beautiful Cedar River and provides an ideal location for a variety of reception and meeting needs. With plenty of free park - ing and easy freeway access, the Renton Community Center is a great location for: Gyms Available for athletic events, trade- show and special events. Private athletic rental rates range $45–$100 per hour. Special event and trade show rates range $550–$1350 per day. Classrooms Meeting rooms are ideal for small par- ties, business meetings and seminars. Accommodate 20-40 people and rates are $35/hr for Residents and $40/hr for Non-Residents. Ask us about our Birthday Party Packages "Bounce Around" (for ages 3-6) & "Good Sport" (for ages 7-13) $75R / $85NR Neighborhood Center Rentals Looking for a facility to hold a smaller meeting or function? The Highlands Neighborhood Center is available for rent on an hourly basis during operating hours from April 1st until June 16th. Contact Tom Puthof f at tputhof f@rentonwa.gov or 425-430-6766. 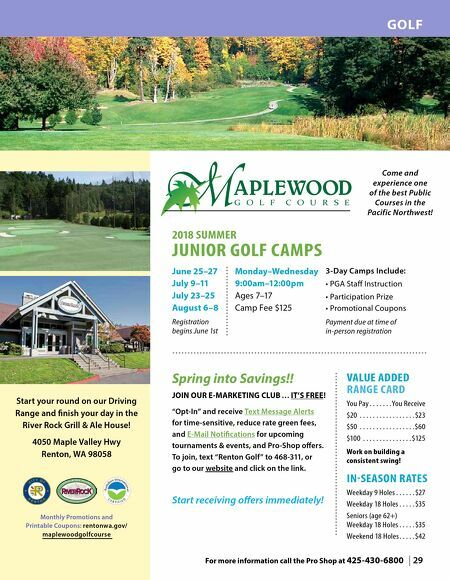 Meeting Rooms & Gymnasium rates $35/hour Residents, $40/ hour Non-Residents Sports Field Rentals Please visit the Facility Rental page at rentonwa.gov for additional information. Questions can be directed to Donna Eken deken@rentonwa.gov or call 425-430-6700.